Union Public Service Commission (UPSC) will conduct Engineering Services Examination for all candidates for the academic year 2016-2017. This Engineering Services Examination consists of two sections i.e. section I and section II. Section I is an objective type and section II has conventional papers. Questions will be asked from engineering subject i.e. Civil or Mechanical or Electrical or Electronics or Telecommunications. Online registration process will start from the date of 03rd August, 2016. Closing date for online registration procedure is 16th August, 2016. 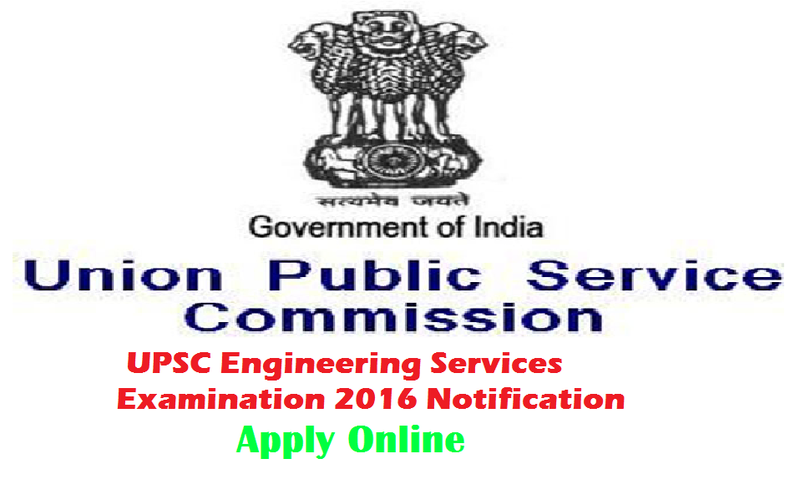 The official notification of UPSC Engineering Services Examination 2016 has been uploaded and all details given below. Read full information for UPSC Engineering Services Examination 2016. To get Educational Eligibility details, candidates please go through official notification of UPSC Engineering Services Examination 2016. Lower age limit for selected candidates must be 21 years as on 01st January, 2016 and upper age limit must be 30 years. This Engineering Services Examination consists of two sections i.e. section I and section II. Section I is an objective type and section II has conventional papers. Union Public Service Commission (UPSC) department requires online application forms only. Online registration process will start from the date of 03rd August, 2016. Closing date for online registration procedure is 16th August, 2016. A) Visit official website of UPSC to apply online for UPSC Engineering Services Examination 2016. B) Read total information regarding post and fill with your details. C) Upload your recent passport size photograph and signature in .jpeg/.jpg format. D) Send online application forms from 03rd August, 2016 to 16th August, 2016. Application form must be made in the language of English. Candidates must remember that, Size of your photograph should not more than 50 kb. After apply online, download the filled in form for future reference.